I'm totally losing my mind! I was at Borders again this Sunday morning in preparation for my slavish workout at the Y downtown, and although I found another 'Crash' magazine (it has Mischa Barton on the cover), I called Kathy of MFO to let her know this. But the two hour time difference, I reckon she was still in bed. So I'm just listening out for her to call/email me back letting me know she wants this magazine, even though Michael's not on the cover, his full interview and glorious photos are in the magazine. (Why in the hell use multi covers for a rare magazine when you have Michael on one of them is beyond me). The steely Irish-German actor Michael Fassbender pushed his body to the brink to portray I.R.A. solider Bobby Sands's 1981 hunger strike. Fassbender, who grew up in Southern Ireland and was 4 when Sands made international headlines, was also concerned about tone, feeling that past films about the Troubles in Northern Ireland had been disrespectful. “Nobody can judge,” he says. “You can just show people a mirror, show them the way that we behave with one another.” His concerns evaporated once he met McQueen, who emphasized that the film was “a human story, not a political story.” After shooting the film’s first two acts, Fassbender spent ten weeks preparing his body for the brutal final scenes which wordlessly track Sands’s hunger strike, dropping the pounds with a diet of nuts, berries, and sardines. “I didn’t think about Bobby,” he says. “I thought about not going over 600 calories. 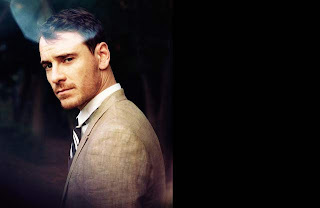 I went really loopy.”Now back to his old weight, Fassbender is looking ahead. His performance in Hunger, which earned a standing ovation at Cannes last year, has opened doors for an actor previously best known for a supporting role in the Spartan epic 300. He also recently starred in the controversial British thriller Eden Lake and in French director François Ozon’s English-language debut, Angel. And this summer, he will appear in Inglourious Basterds, the long-awaited war epic Quentin Tarantino, whose Reservoir Dogs Fassbender adapted for the stage when he was just starting out at 18. “I've come full circle,” he says. HOly Cow! What section was Vman in?? I was goign to stop at Borders Tomorrow. LOVE that picture!! I know, that photo is totally hot! I gasped when I first saw it. well I stopped at borders today and they had neither creash or vman. I made then check the magazine list and neither were listed! You must have one really nice Borders! Well considering that the headquarters for Borders Books & Music is right here in Ann Arbor, yeah, they better be well stocked. LOL!